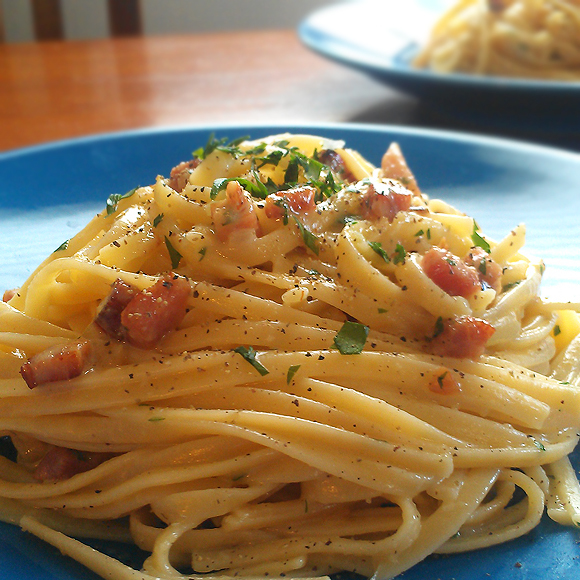 This carbonara version tastes just like the one with bacon, but it's healthier because you don't get all that bacon grease. And if you're looking for a way to sneak eggs into your kids' diet, this is the way to go! They love noodles and won't even know they're eating it. My son is a perfect example of this. He refuses to eat eggs for me for some reason. It's pretty much the only thing he's never eaten over here. My dad has made him omelettes in the past and he's loved them, but forget about it when I make them! I just don't get it. I have come to terms with this strange form of rebeliousness though. The funny thing is that he knows there are eggs in some things that I make but will still eat them. 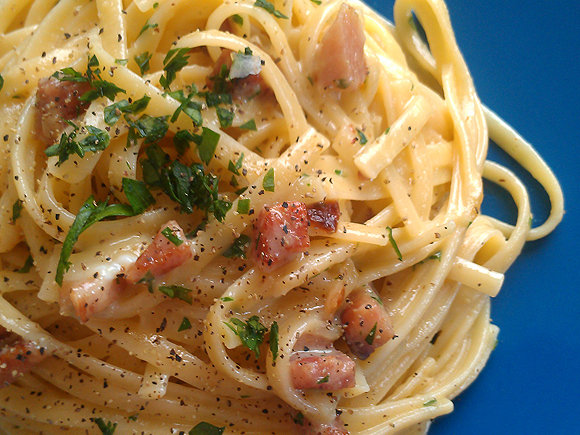 Like this pasta for one! As he was eating it (I made sure to know he liked it first) I told him there were eggs. He didn't seem to mind one bit. This kid drives me nuts some days. 1. Cook pasta according to directions. While the water is boiling, heat oil in large, heavy bottomed pot over medium heat. 3. Beat eggs, parmesan and parsley together in a bowl and set aside. 3. When pasta is al dente, reserve 1/2 c pasta water and drain noodles. Add noodles and 1/4 c water to pot with ham and onions. Mix well. 4. Add egg mixture to pan and toss pasta with tongs until eggs are set. If you'd like it a little creamier, add the remaining 1/4 c pasta water and toss again. 5. Season with salt and pepper to taste. Serve with additional parmesan.